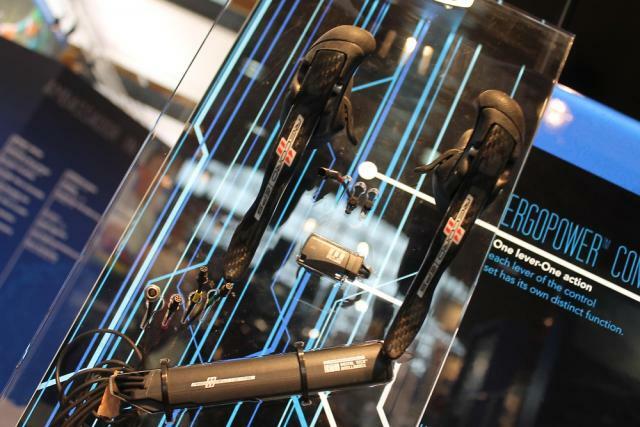 Campagnolo have launched a new power unit for their EPS electronic shifting system that is capable of being mounted within the bike’s frame. Shimano already have a vaguely similar battery for their Di2 system. We’ve known for some time that the new power unit was coming, we’d suspected that it would be launched at Eurobike, and sure enough, here it is. Campagnolo say: “The new profile allows for internal mounting which not only offers the obvious aerodynamic benefits associated with hiding a component inside the frame but also keeps the unit protected from the elements and impact. The rechargeable lithium-ion battery comprises three cells for a 12-volt output. How long you go between charges will vary depending on route and riding style: the less you change gear, the longer each charge will last. Campagnolo reckon, though, that on average you’re looking at about 1500km (937 miles) per charge. The battery is guaranteed to last for over 500 charges – so getting on for half a million miles! Battery life probably isn’t going to be an issue, then. The battery has been built to absorb vibration and there is a certified waterproof casing around the motherboard. Campagnolo say that the casing that encompasses the internal componentry is sealed with an ultrasonic welding process that further guarantees the integrity of the waterproofing. The new EPS V2 Power Unit weighs just 132g, compared to 167g previously.